Theresa May is to announce plans to boost Britain’s investment in Africa after Brexit, during her first trip to the continent as prime minister. At a speech in Cape Town later, Mrs May will say she is “unashamed” about ensuring the money the UK spends on aid in Africa benefits Britain too. The PM will say she wants the UK to overtake the US to become the G7’s biggest investor in Africa by 2022. The trip – which will see Mrs May meet the presidents of all three countries – aims to deepen economic and trade ties with growing African economies ahead of Britain leaving the EU in 2019. Arriving in South Africa on Tuesday morning, Mrs May is expected to announce an “ambitious new approach” to the UK’s aid spending in Africa, by using it to help British private sector companies invest on the continent. Private sector investment is key to driving growth and “unleashing the entrepreneurial spirit” in Africa, she will say. In her speech, the prime minister expected to say that creating jobs on the continent – where many countries have young populations – is “in the world’s interest”. It is the best way to tackle extremism, instability and migration to Europe, Mrs May will claim, adding that otherwise the environmental and economic impacts will reach every corner of the world. The prime minister, who is being accompanied by business leaders and ministers during her visit, will also set out her aim for the UK to be the “number one investor in Africa” out of the G7 group of developed nations by 2022. The UK’s overseas aid budget totalled £13.9bn in 2017, an increase of £555m in 2016. UK direct investment in Africa was £42.7bn in 2016, compared to £44.3bn from the US, £38bn from France and £31bn from China, according to data from the United Nations Conference on Trade and Development. Tuesday – Mrs May will fly into Cape Town where she will meet young people, before delivering a keynote speech on trade and how UK private sector investment can be brought into Africa. After a bilateral meeting with South African President Cyril Ramaphosa, she is expected to visit Robben Island, where Nelson Mandela was imprisoned. Wednesday – Mrs May intends to meet Nigerian President Muhammadu Buhari in the capital Abuja before meeting victims of modern slavery in Lagos. Thursday – In Kenya, Mrs May will meet president Uhuru Kenyatta before visiting British troops and a business school. A state dinner hosted by Mr Kenyatta will conclude the trip. Mrs May previously said the trip would be a “unique opportunity at a unique time for the UK”. She will be accompanied to the three countries – all of them Commonwealth countries – by a 29-strong business delegation. 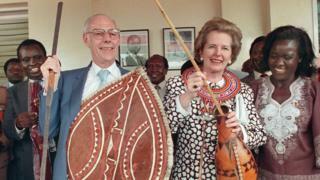 Mrs May’s visit to Nairobi will mark the first by a UK prime minister to Kenya since Margaret Thatcher in 1988. It is also the first to Sub-Saharan Africa by a British leader since David Cameron in 2013 for Mr Mandela’s memorial service. 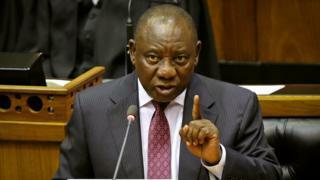 During her time in South Africa, Mrs May is also due to present a World War One relic – linked to one of the worst maritime disasters in English waters – to South African President Cyril Ramaphosa. The SS Mendi sank off the Isle of Wight in 1917 killing more than 600 South Africans en route to the Western Front to support British troops. 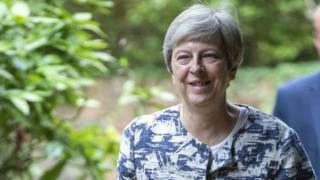 The ship’s bell was given to BBC reporter Steve Humphrey in 2017 in a plastic bag at Swanage Pier, Dorset, after an anonymous phone call – and will now be handed back by Mrs May.